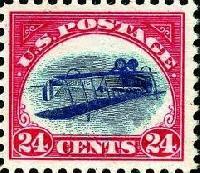 This was the first stamp for air-delivery issued in 1918. While printing the sheet had to be fed through the printing machine twice. So accidently the second sheet was flipped and thus one sheet was printed with an upside down Jenny. Thus the Inverted Jenny got created. Only a 100 pieces of the Jenny are found in the world. 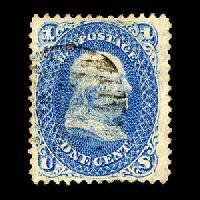 Designed by Rowland Hill, or the Father of the Postage Stamp, this is the first stamp in the world. Before this ost offices had to take payments for mail delivery in cash. Hill suggested to wrap the leter in a piece of paper and n adhesive stamp was attached to indicate the prepayment of postage. This concept later came to be known as a postage stamp Penny Black. 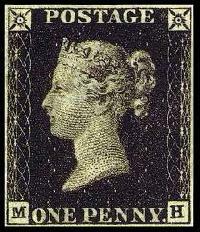 The stamp shows Queen Victoria. The stamp was only used for one year since its cancellation mark was tough to spot. 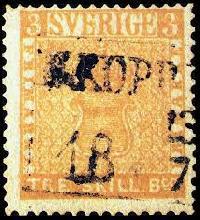 The Treskilling Yellow holds the world's record auction sales price for a single postage stamp. The normal three-skilling stamp, was to be green, whereas the eight-skilling stamp was to be in yellow. Due to an unknown error in 1855 the three-skilling stamp was printed in yellow, creating this precious Treskilling Yellow stamp. The only copy of this Treskilling Yellow was discovered by a schoolboy in 1886, while going through his grandparents' attic. Born in Canada, "Lady of the Lightbulbs". Electright light inspection stamp; this stamp was used on inspection reports of the electric wiring inside the house, and were issued in a variety of values. These were the first stamps issued by Brazil on 1 August 1843, having face values of 30, 60, and 90 r?is. The design does not include the country name. The unusual name derives from the ornamental value figures inside the oval settings and the arrangement of the stamps in the sheet permitted se-tenant pairs that looked like a pair of bull's eyes. This Basel Dove is a notable stamp issued by Swiss canton of Basel, the stamp also happens to be the first tricolor stamp (printed in black, crimson, blue) of the world and was issued in 1845. The stamp, designed by the architect Melchior Berri, featured a white embossed dove carrying a letter in its beak, and was inscribed "Stadt Post Basel". The stamp was later decommisioned in 1854. Many countries have issued postage stamp in the name of great people, this stamp is no less. The Benjamin Franklin Z Grill, or simply "Z-Grill", is a 1-cent postage stamp issued by the United States Postal Service in February 1868 depicting Benjamin Franklin. Even though this is the most valuable stamp, the 15-cent Lincoln Z-Grill and the 10-cent Washington Z-Grill are just as rare too. The name Z originates from the "Z" variety of a grill pressed into the stamp, creating tiny indentations in the paper. Similar to it D & E grills are also used. Gradually the use of grills was found to be impractical and were discontinued in 1870. 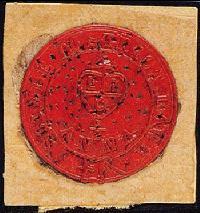 In a more ancient time of postal system, this was termed as the first adhesive postal stamps. The stamp originated in the Indus Valley of Sindh (Pakistan now). The name derives from the words ?Scinde?, the British name of the province of Sindh, and ?Dawk?, from Hindustani word ?Dak? or Post. The Inverted Head Four Annas, is a collector's delight. 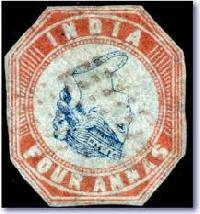 Issued in 1854 the stamp was lithographed by the Survey Office Calcutta. Two colors were used, red for the frame and blue for the head. During its production, the paper was first imprinted with the red frames and then blue heads were added within the frames. Though the name suggests Inverted, this arose from a mistake in printing showing the head upside down. It is also considered as one of the world's first multi-colored stamps along side Basel Dove which was also printed in the same era. The stamp featuring Mahatma Gandhi (bapu) was India's most famed stamp. Made in 1948, and overprinted with the word "Service" this was one of India's most rarest and costliest stamp setting a record for the most expensive modern stamp. The stamp was also used by Governor General of India for official use. 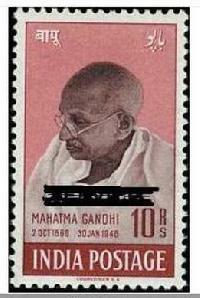 According to reports, before the stamp could be issued Gandhi was assassinated. Thus the stamp were released as a memorial to the Great Indian Leader.